Thankfully, it is rarely a connecting rod nowadays. We have modern knock control strategies to thank for that! It is no longer very common for detonation to destroy an engine and that is because most of the latest ones are controlled by a well programmed closed loop ignition correction system. 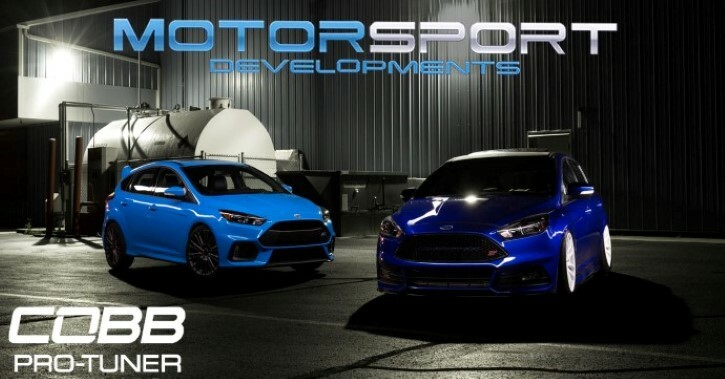 As we sell a lot of COBB stuff and the Accessport allows you to monitor such ECU data-channels and feed it back to us for remote tuning, I decided to write a little about the Ford Focus EcoBoost knock control system. First things first... Let's put something to bed. To a certain extent, ALL modern spark ignition engines knock. It is the intensity of the knock that causes concern. Put simply, knock (often called detonation) is quite simply combustion of the air / fuel mix that was initialised by the spark plug but did not progress into a controlled, smooth flame front. Quite often it propagates instead into a series of colliding flame fronts and it is these fronts that cause the huge pressure spikes that destroy things with both pressure and intense heat. Pre ignition, whilst often picked up by the system too, is NOT the same thing. Pre ignition, as its name suggests, is combustion of the air / fuel mix that was NOT initialised by the spark plug but started BEFORE the plug fired. Typically it makes a loud "Ping" type noise, and the Americans called it, quite sensibly in my opinion, "Pinging.."
How does active knock detection and correction work? 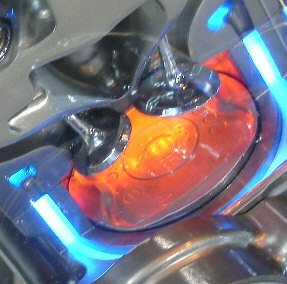 The 4 cylinder EcoBoost utilises two microphones, known as knock sensors that allow it to listen to the unique sound frequency of each individual cylinder. Since detonation causes an audible noise (its frequency is determined by the cylinder bore size) it can be accurately detected, audibly, with these carefully placed and tuned microphones. 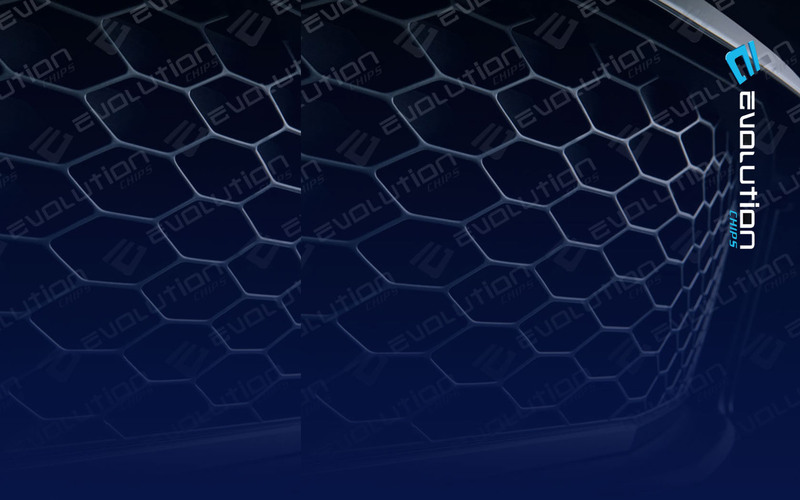 If no detonation seems to have taken place, the ECU will advance the spark in the cylinder up slightly until either it reaches a programmed max advance limit, or it detects detonation. As you might expect, if it detects detonation it will retard from there immediately to ensure no damage. The EcoBoost engines do this constantly, always keeping the system running at peak performance. The ECU is constantly walking up the advance and retarding back down again when single knock events are recorded. This is done on a cylinder by cylinder basis too, so while some are advancing, others may be retarding. Why do we intentionally allow the engine to stay so close to knock? It might seem odd that manufacturers are actively looking to make engines knock. 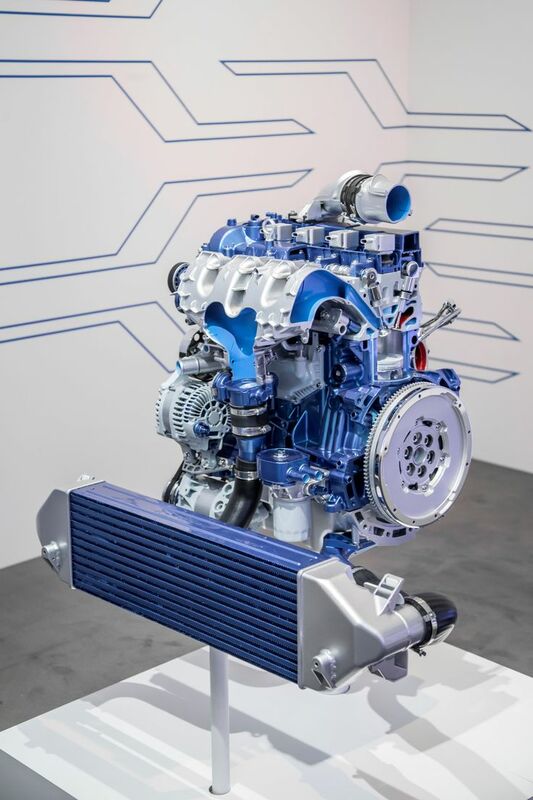 The reason for this is that we are looking for more power and efficiency from small capacity engines now and the simple fact is, engines give their peak performance right on the very edge of knock. It is a dangerous place to be unless you have the control system in place to monitor it. Thankfully, we do have those control systems now. The ECU can retard the timing a great deal in case of heavy knock and of course it can start dropping load too and even close the throttle completely if need be, it has a great degree of control over the combustion process and the loads allowed. As standard, the Ford Focus RS Mk3 ECU allows up to 8 degrees to be removed from any or all cylinders immediately, depending on the severity of the knock encountered so it is almost impossible to maintain any level of knock with this system in place and working well unless the tune is poor. So, is this system actually able to damage my engine? As long as it is tuned properly then not at all. What you must remember is that this system is good enough to detect and act upon a knock event detected in a single cylinder on a single combustion event. The knock you read about blowing engines to pieces usually lasts a couple of seconds or more, and at 6000rpm that is potentially hundreds of knock events in a row, which is where the huge levels of piston melting heat comes from. Also, the system is limited to how far it can advance up. Essentially, amongst the ECU's 1000+ tables are a selection of knock control tables where we can calibrate things such as knock sensitivity, advance rate, retard rate, maximum retard (see below). And of course a maximum advance figure (see below). So as you can see, whilst the ECU has plenty of spark adjustment ability, it also can't advance as far as it can retard. It is programmed to only allowed enough advance to keep that particular engine platform and tune at its best. That data is of course all tunable so it is perfectly possible for a tune to compromise this system and leave it sub optimum or even damaging. The figures in these tables are all for a factory standard car, we tune them to better suit our own load strategies and all tuners will have a different way of doing this. Some tune to even safer limits than standard, some tune far less safe... and believe it or not, some turn it right off so it doesn't work. Why not just run a safe advance figures and leave them there, like we did in the 80s? Fuel octane and variable customer requirements mainly. This system allows you to use pretty much any fuel in your engine and the ECU will adjust for it. Remember back in the good old days of say, Cosworth YB tuning - the old Weber platform? If we accidentally ran our 500BHP 2.5 bar of boost engine on some bad 93 RON fuel, we often detonated it to pieces! The ECU was tuned for 98, we ran 93 and we got our wallets back out for more engine parts. But if you want to run your standard Focus RS Mk3 on 95 RON, just go for it. The ECU will detect any fuel knock and retard the timing (and lower the boost). If you want to enjoy maximum power from your engine, great, fill up with high octane fuel and the ECU will advance the spark tables (And raise boost) up for you. Given enough time to adapt, full power will be restored with no tuner intervention. 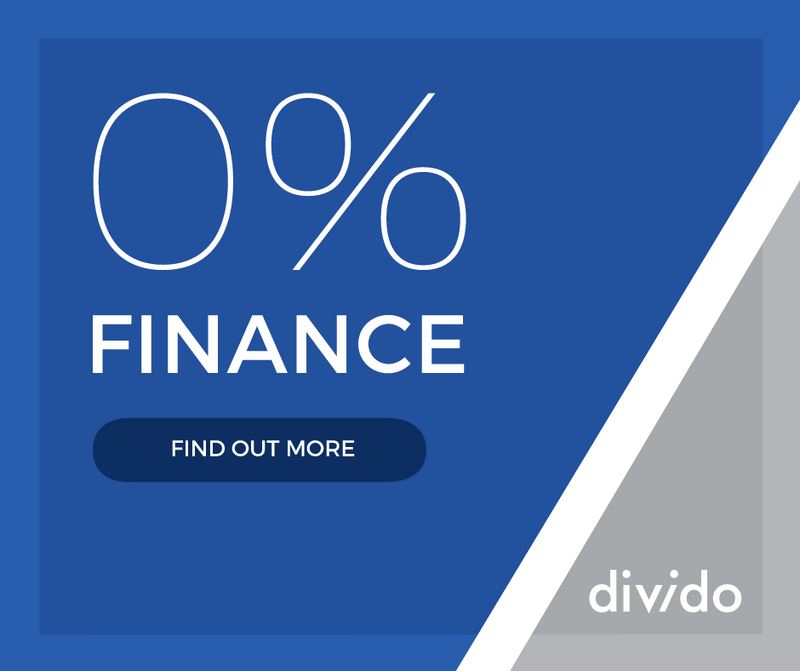 This is all great news for all manner of reasons -, reliability, convenience and of course from the OE point of view, warranty cost. But of course it means we can now have our cake and eat it. A high performance engine that turns into a lower performance engine with bad quality fuel. Perfection... (whilst its working). Well, it can. The ECU shouldn't be left constantly making fruitless adjustments that just cause knock, so it has some machine learning built in. One cars owner may want to always run 98RON, while another always runs 93RON, so the ECU needs a strategy to allow it to figure out what’s in the tank so that it can start off with suitable spark numbers from the outset. Whilst constantly adjusting your ignition timing (and load, we will come to that soon) it also has a very good idea what octane fuel is in the tank too. It needs to know this, because your in tank fuel octane has the biggest effect on engine knock levels because it is of course the fuel itself that is knocking. If the ECU is detecting constant knock and always needs to be retarding your timing, then we are running low octane fuel. If the ECU is adding lots of advance and rarely detects knock then we must be running high octane fuel. The ECU uses the knock amplitude, or knock level, to determine the approximate octane of the fuel and then utilises this information to reference a constant ignition and load modifier table called the OAR. The worse your fuel octane, the higher your OAR number and the more advance is subtracted from your base ignition table. Conversely, the lower the OAR, the more spark is always added to your base table. The OAR system also utilises three load tables and constantly blends your allowed engine load between those three Low, Normal and High octane tables. (Lets call them 93, 95 and 97 RON tables just to aid discussion). Your 93 octane load limit table allows less piston crown load than the 95 RON table, which in turn allows less than the 97 RON. For easy discussion, we will use rounded numbers to explain how this works. Let's say the 93 RON table allows 1.0 load, the 95 RON table allows 2.0 load and the 97 RON table allows 3.0 load. If the ECU determines RON to be around 94, it would cap your load at about 1.5 by blending the data from the low and normal tables. If it decides we are running 98 RON, it would allow the full 3.0 load, so no matter how much power is programmed in your tables, the OAR strategy acts as a final ceiling to control cylinder pressure based on fuel octane in the tank right now. The ECU of course regularly tests the water with more spark to see if you changed the fuel octane but it doesn't tend to swap back up to higher octane load tables quite as fast as it swaps down to low octane tables. It is biased towards engine protection so it will detune and limit load quickly to save damage, but it gives that power back a lot slower more controlled rate. Quite rightly. The text on this page pertains to a standard calibration. ALWAYS follow your tuners advice with regards fuel octane. But regardless, if you want maximum performance without a long drive to allow the ECU to adapt back upwards, keep your tank full of decent quality fuel at all times. It is	worth a note to mention here that EcoBoost doesn't target "boost" at all, it actually targets Newton Meters of torque and converts that torque request into an air mass target that will create the perfect cylinder load to get the job done! But... if you want to think of the above load limits in good old fashioned boost terms, then think of those load numbers as bars of boost to help you understand the way they are also boost limiting tables based on the octane of the fuel. I will do a blog on load control Vs boost control soon as some tuners disable the whole load control system too! If this detection and adaption system fails and the engine is left to knock, what will happen? This varies according to its severity. Very light knock can exist with no problems for extended periods of time. Heavy prolonged knocking literally melts alloy components like it is chocolate. It also bends connecting rods and can throw a rod clean out of the block for you. A more recent discovery of the last 6 years or so is certainly applicable to EcoBoost engines and that's Low Speed Pre-Ignition. (LSPI for short). Not technically a knock event initially, but it usually leads onto extreme knock, which is often termed as Super knock or mega knock by manufacturers. This can destroy an engine in mere seconds. What is LSPI / Super knock / Mega knock? Low Speed Pre Ignition is an event triggered at reasonably low engine speeds where the fuel lights prior to the spark plug initiating it. It is thought to be caused by a large number of issues coming together to combine the LSPI event, including a reaction to some oil additives and fuel mixtures etc. Interestingly, it seems to happen a lot in the region where typically best fuel economy is produced. However, it is agreed without doubt that it is primarily triggered by a very sudden and sharp rise in cylinder pressure at low engine RPM's. For this reason, modern management systems strictly limit the rate at which torque can rise and indeed how much can be generated very low down in the rev range. This is extremely strong knock that has been caused by the Low Speed Pre Ignition mentioned above. 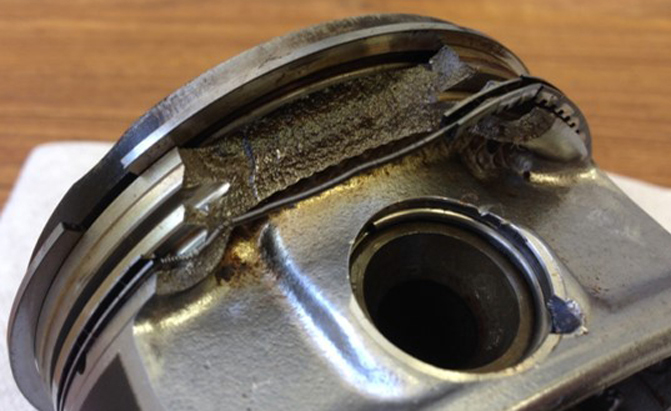 At best it blows head gaskets, but it is far more common for it to destroy piston ring lands, crack pistons and bend connecting rods. It doesnt usually get to the melted engine stage as the ECU does its best to combat it. Your ECU will be doing all it can to avoid the triggers that cause this deadly LSPI, but good high octane fuel is proven to help so we always recommend 97+ in these modern turbocharged direct injection engines. For those of you tuning, take care to avoid any tunes that seem to ramp up all the load and boost low down. We can all do that... finding torque in these modern engines is quite simple, but those of us whom understand LSPI and Superknock will avoid doing so for very good reason. So what is "normal" knock in my logs you might ask? Ignition should be going back and forth over a number of runs in small numbers, typically advancing less than 2 degrees at a time as a rule. Each cylinder may well be different and each cylinder may well be adding or subtracting ignition at any time... That’s the ECU doing its job. What you don't want to see are huge NEGATIVE corrections, like -3 to -8 degrees at a time, regularly. If you are only seeing small knock count numbers, then your tune is keeping everything absolutely on point and you have nothing to worry about. You will always see knock counts unless your tuner has dumbed the system down a bit. Seeing knock counts of 3 and above regularly may be a sign you have an issue that needs looking at, or your tune adjusting. But not necessarily - it is all about how MUCH intervention was needed by the ECU, as that ignition retard level is what dictates the severity of the knock. Typically, a couple of degrees here and there are fine, but regular large ignition corrections are not. As always, our COBB Accessport customers can send us logs to review if ever they want some advice, just follow the advice here. A first port of call to ensure no knock on any modified EcoBoost is to check your spark plug heat range. Be sure you are running the plugs your tuner recommends for that level of tune. Hope you enjoyed this blog folks.